Who invented the Hoverboard? The name of the person credited with inventing the Hendo Hoverboard is Gregory "Greg" Henderson the American inventor and Co-founder & CEO at Arx Pax. When was the Hendo Hoverboard invented? Greg Henderson invented the Hendo Hoverboard, a levitating skateboard that could carry a person. The Hendo Hoverboard invention was filed for patent on October 31, 2013 and patented on September 18, 2014. An American inventor and entrepreneur called Shane Chen invented a self-balancing two-wheeled scooter board in 2013, popularly known as the "hoverboard", however it did not have the ability to lift and hover. Definition of the Hoverboard: The term 'Hoverboard' was coined by Science fiction author M. K. Joseph in 1967 and popularized by the 1989 'Back to the Future Part II' movie. The Hoverboard resembles a skateboard and is defined as a form of transport, ridden in a standing position, that travels above the surface of the ground. Fact 1: Who invented the Hoverboard? The Hoverboard was invented by Greg Henderson in September 18, 2014 during the Technology and Information Age era of inventions and brought a science fiction fantasy to life by creating a working, hovering skateboard, known as a hoverboard. Fact 2: Who invented the Hoverboard? Prior to the invention of the levitating hoverboard people had been fascinated by the futuristic hovering skateboard that was used by Marty McFly (played by Michael J. Fox) in the 1989 time travelling movie 'Back to the Future Part II'. Fact 3: Who invented the Hoverboard? The special effects team of the 'Back to the Future Part II' movie, headed by Michael Lantieri, created a crane-suspended camera platform and wire-rigged skateboard to give the illusion of a 'hoverboard'. Fact 4: Who invented the Hoverboard? Kids loved the idea of Marty McFly's hoverboard, the movie had coincided with massive popularity of fiberglass skateboards and the growing number of skate parks. It would be over 20 years before science fiction fantasy would become a reality. Fact 5: Who invented the Hoverboard? Greg Henderson was raised in California and his first job was as a framer for a home building contractor called SR Freeman Construction in Campbell, California. It was here that Greg Henderson gained practical experience in architecture assembling the major structural elements of a wood-framed buildings. He went on to work as a residential designer for Square Three Architecture in Palo Alto, California. Fact 6: Who invented the Hoverboard? After graduation from Saratoga High School in 1984, Greg Henderson enlisted in the US Army and was assigned to the 7th Infantry and the 101st Airborne Division where he received a Presidential nomination to the United States Military Academy at West Point. In 1989 he gained Bachelor of Science degree in engineering at the military academy. Fact 7: Who invented the Hoverboard? Greg Henderson was given the nickname of "Hendo" as an Army Ranger - the name would be later used in the 'Hendo Hoverboard'. Fact 8: Who invented the Hoverboard? Greg Henderson undertook various building projects and in 1997 continued his studies in architecture at West Valley College, a community college in northern California, part of Silicon Valley's West Valley. Fact 9: Who invented the Hoverboard? Greg Henderson went on to attend the College of Environmental Design, also known as the Berkeley CED, part of the University of California, where he earned his Master of Architecture degree in 2003. Fact 10: Who invented the Hoverboard? Living in California and as an architect Greg was acutely aware of earthquakes. Earthquakes in California are common occurrences because the state is located on the San Andreas Fault, which forms the tectonic plate boundary between the Pacific and the North American Plate. Fact 11: Who invented the Hoverboard? Greg Henderson's goal and mission in life was to to find a better way to protect buildings against earthquakes. Fact 12: Who invented the Hoverboard? In 2012 Greg Henderson and his wife Jill founded Arx Pax Labs, Inc. and developed Magnetic Field Architecture (MFA) technology to employ electromagnetic fields to raise a building out of harm’s way. Fact 13: Who invented the Hoverboard? Experiments with Magnetic Field Architecture (MFA) technology was combined with Maglev mechanism, used with trains. Maglev (derived from magnetic levitation) is a method of transportation that uses magnetic levitation to move vehicles without making contact with the ground. Fact 14: Who invented the Hoverboard? Arx Pax used the MFA and Maglev magnetic levitation technologies to develop an emergency maglev mechanism capable of separating buildings from the earth to protect them from floods and earthquakes. Fact 15: Who invented the Hoverboard? Greg Henderson realized that the same technology could be useful for a variety of applications. Greg and Jill remembered the impact of Marty McFly's hoverboard and began experimenting with a prototype that could lift a weight. Fact 16: Who invented the Hoverboard? Jill Henderson tried the first prototype and became the first real hoverboard rider in the world. Jill and Greg realized that such an invention would to call attention to Arx Pax Labs, Inc. and their vision to create earthquake protected houses. Fact 17: Who invented the Hoverboard? On Oct 31, 2013, Greg Henderson filed a patent application for the magnetic levitation of a moving or stationary object. He was granted the patent on September 18, 2014, Patent number US9148077. Fact 18: Who invented the Hoverboard? The Hoverboard was launched to the public on October 21, 2014 and Arx Pax went on to build the Hendo Hoverboard. Fact 19: Who invented the Hoverboard? The Hendo hoverboard, lifted by a magnetic field can levitate about an inch from the ground but can only work on certain surfaces, such as metal floors, that can support the magnetic field. Fact 20: Who invented the Hoverboard? 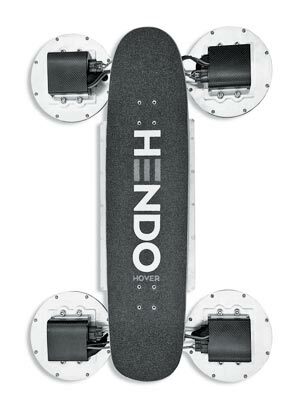 The Hendo Hoverboard came equipped with four electrically charged magnets, or electromagnets, referred to by Arx Pax as "hover engines". Fact 21: Who invented the Hoverboard? The Hendo Hoverboard, inspired by science fiction, has become a reality and we have all literally gone 'Back to the Future'!